Welcoming the new 2018-2019 Board ! 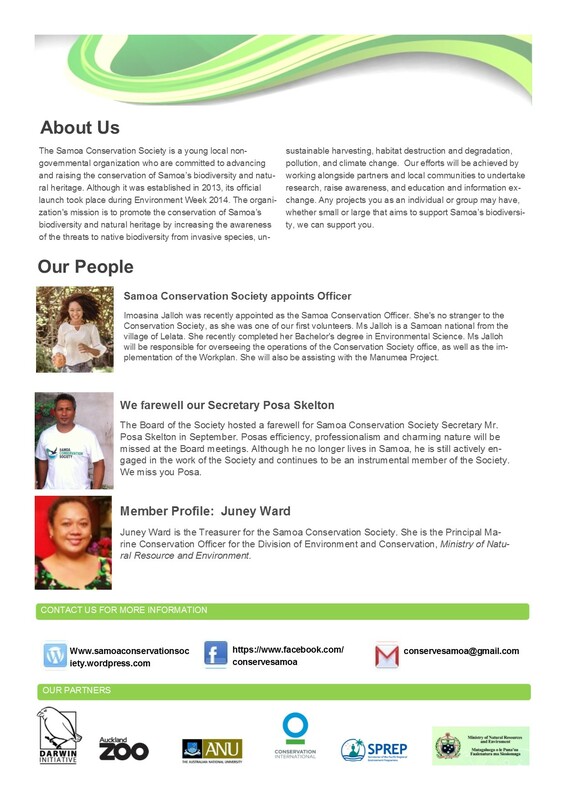 The Samoa Conservation Society’s Annual General Meeting was held on Saturday the 20th of August at the Apia Yacht Club. It was a great day for the Society as a new board was elected. The following members were chosen to continue the amazing work of the Society in the coming year. Executive Members- Leilani Duffy, Kathleen Taituave, Paul Anderson, Benjamin Harding. We would like to take this opportunity to especially thank our previous Board members for all their tremendous work during 2017-2018. We look forward to another exciting year of conservation success and fun! 30 rural youth engaged in Carbon Offset at O Le Pupu Pu’e National Park. The Samoa Climate Smart Reforestation Carbon Offset Project (C-offset) kickstarted in Togitogiga this week. 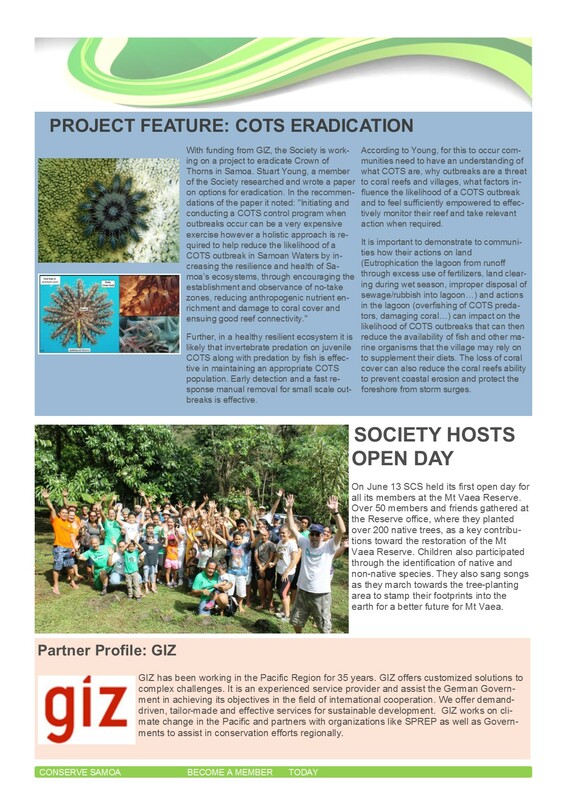 30 Young people from the villages of Sa’aga, Poutasi and Saleilua were successfully inducted as Carbon Offset Champions to do native tree replanting as part of the Coffset project by the Samoa Conservation Society in partnership with the the Forestry Division of the Ministry of Natural Resources and Environment. 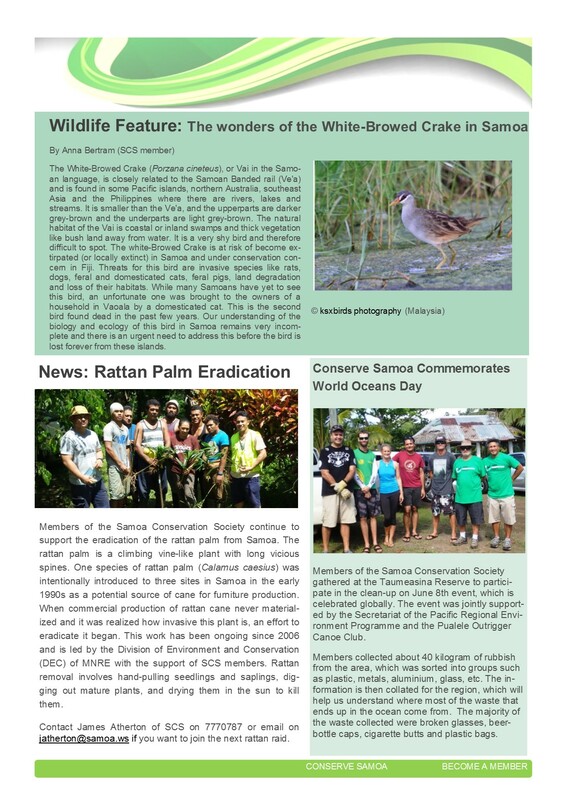 Funded through the Small Grants Programme of the Global Environment Facility, the project tackles; Restoration of degraded forest, Tackling Youth Unemployment and alleviating poverty, Raising Environmental Awareness of youth especially women and Engaging the public and private sectors in Samoas first Carbon Offset program. The Project takes on 30 Champions from the Villages Sa’aga, Saleilua and Poutasi where they will participate in the growing of native trees in the national park. Of those 30 champions there are 9 females participating to highlight the importance of women’s role in the fight against climate change. The 30 Participants will be engaged for a total of 50 days over the next 8 months, 40 of those days being fieldwork and 10 days in the classroom where they will learn different ways in which they can help the fight against Climate Change. “The young men and women will work closely with Forestry experts from MNRE and with Samoa Conservation Society to improve their skills and knowledge of forest management and conservation in general,” said Christine Tuioti, Project Manager for Coffset. With the launch of the Project the Participants were given gear to assist them in their work on the field. The First day started with a briefing where the participants were shown the processes of the work that they will be carrying out by MNRE Forestry experts. The Champions were eager and excited to be learning about the restoration of native species as well as contributing to the overall well being of the land. By the end of the Project, the aim is to plant 12,000 trees and to have raised awareness amongst our youth for the persistent Environmental issues we all face. The Project has exciting prospects as it addresses a range of problems in a holistic fashion under the broad themes of environment and socio-economics. We have hopes to expand this project all over our Nation. We thank all our partners and donors as well as local communities and organisations who are contributing to the conservation of and restoration of Samoa’s native forests. Environmental champions look on as Forestry expert Peteli Pese demonstrates the importance of soil preparation before potting of seedlings. Environmental champions with SCS & MNRE Forestry project team. Falealili Seasonal Workers lead the way in being Climate Change Warriors! Once again apple pickers from the Falealili seasonal workers (RSE) scheme lead the way in efforts to fight climate change and restore damaged native forests by planting more than 250 native trees at the O le Pupu Pue National Park on Tuesday June 13. The tree planting is part of the Carbon Offset Project initiated by the Samoa Conservation Society in partnership with the Ministry of Natural Resources & Environment (MNRE) and the Poutasi Development Trust. These RSE workers returned in early June from NZ and were employed by Mr. Apple. On May 29 a group of more than 90 seasonal workers who had worked for Johnny Appleseed in Hastings NZ planted 630 native trees, an effort acknowledged by the Rt. Hon Prime Minister of New Zealand, Afioga Leulua’iali’iotumua Bill English, as a great effort and one of many testimonies to the success of the RSE Programme in the Falealili District. Tuatagaloa Joe Annandale, who is coordinating the seasonal workers from Falealili, says his team of seasonal workers are very proud to go green and to set an example for other large traveling groups to follow. Tuatagaloa says “We hope that our example of doing something practical to offset our carbon footprint and restore our degraded forests by planting trees will be followed by other Samoans, especially large travelling groups that may have a significant carbon footprint”. Mr. Peteli Pese, representing MNRE Forestry, thanked the RSE workers for their worthy contribution to this Carbon Offset Programme and wished them well on their future endeavours under the RSE Programme. In response, Alaimoana Esau on behalf of the Group, congratulated the Ministry and the Samoa Conservation Society for such a good initiative and pledged the on-going support of the Falealili RSE Workers in not only planting more trees upon their return after each season but in the maintenance of the areas that have been planted. Samoa’s Carbon Offset Project (C-Offset) was launched at the OLPP NP in October 2016. Initiated by the Samoa Conservation Society in partnership with the MNRE and local communities, the project helps individuals, groups and businesses to offset carbon emissions from the transport sector, with a focus on air travel. This project supports the Samoan government’s priorities to improve environmental sustainability, mitigate climate change and improve disaster resilience while at the same time contributing to the livelihoods of our communities. While the OLPP NP is currently the focus of Samoa’s C-Offset project, there are plans to restore other sites in the future on both Upolu and Savaii. Apia 12/10/2016 – The first Carbon Offset Project (COffset) for Samoa kick started its pilot phase this week in the villages of Poutasi, Saleilua and Saaga. Initiated by the Samoa Conservation Society in partnership with the Ministry of Natural Resources and Environment (MNRE) the Project pilots activities to offset carbon emissions from the transport sector, with a focus on air travel. Many airlines now have a “carbon offset” option when you book your flight. According to Atherton, because climate change is a non-localized problem, it doesn’t matter where the emissions are reduced. Greenhouse gases spread evenly throughout the atmosphere and reducing them anywhere contributes to protecting the climate. The same method can be used to offset the annual mileage accumulated by an automobile, or the emissions of a stationary source such as a power plant or even office power usage. The COffset pilot phase began initial activities earlier this year funded by the carbon offset payments of three local donors to start the planting of over 500 trees at the Ole Pupu Pue National Park. “We are aiming to offset 100,000 kg CO2 from air travel of 3 private donors. Samoa’s new COFFset project will help to restore our degraded forests, own up to our responsibilities, and involve communities through youth engagement,” said Atherton. The initial phase of the project is implemented through the villages of Poutasi, Saleilua and Saaga. Staff from the Society and MNRE are working with young people and members of the community to replant and maintain areas replanted under COffset. “Young people from the three villages are being trained in tree propagation and forest restoration and are doing all the restoration work,” Atherton said. Forests in Samoa as in the Pacific continue to decline as a result of various threats these include logging, agricultural activity, the spread of invasive species and extreme weather events, especially cyclones. Samoa’s forest cover has gone down from around 75% in the 1950’s to less than 60% today. Some experts believe that a quarter of remaining forest is highly degraded and dominated by invasive plants such as fa’apasi, tamaligi, pulu vao, and pulu mamoe. By focusing on replanting and restoring native forests, the project will also assist in promoting and preserving habitat and food for our native biodiversity including birds, flying foxes, reptiles and invertebrates which evolved with native plants and forests. 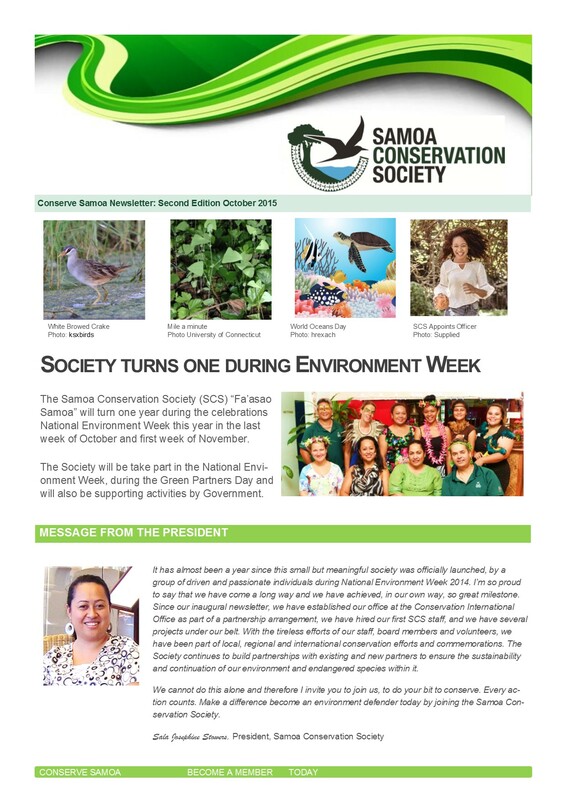 Samoa Conservation Society Open Day – members and friends in Action! Forest Heroes lending a helping hand! Onward march to plant a tree! Greg demonstrating how to plant a tree. Young man with a big biodiversity smile! Cheers to SCS Open Day! Greg plants his 10th tree! The youngest Forest Hero brought her mum with her! Even James brought her mom! Wide-brim hat was needed to keep the rain at bay! Happy to be helping out. All smiles and raring to go! The trees for the forest! President checking out the orchids in the nursery! Healthy body is a healthy planet. Getting the little ones ready. Learning about flower power and colours. Happy sisters joining in the forest day! Handsome Filia Jr with his flower power! The way to the planting site. I’m on to my 25th tree! High on the hill … there were people planting. Tree number 10 for me! I’m so excited…I just can’t hide it! Doing it for my son! This is Posa’s one and only tree planted. May it grow bigger than all the others. Doing it for the love of the land! Not in my job description this morning. You ain’t a farmer until you sweat hits the earth. The hat came in handy too. I H2O a few plants around here. Doing it for the Blue Ocean! Sina smiles as she planted more than Posa. Hold the plant this way! A soil in time saves a tree! Categories: Uncategorized | Tags: Mt Vaea Reserve, Open day; | Permalink.